An interesting new security feature coming to Windows 10 (Enterprise) has been outlined in the Microsoft Insider Feedback Hub. 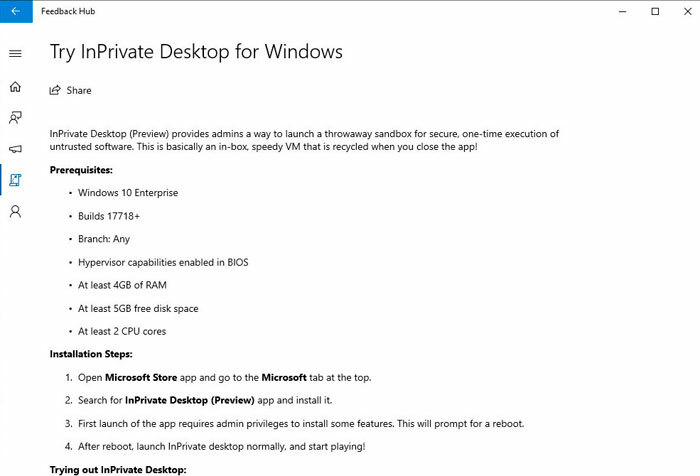 'InPrivate Desktop' is a security feature for Windows 10 that provides a safe sandbox environment to trial and test untrusted applications. Notes indicate that InPrivate Desktop is a basically a contained throwaway environment powered by virtual machine technology. BleepingComputer uncovered the possible upcoming new security feature and captured a screenshot with pertinent details from the Microsoft Feedback Hub. Unfortunately the information page has since disappeared. However the screenshot is reproduced below for your convenience. "InPrivate Desktop (Preview) provides admins a way to launch a throwaway sandbox for secure, one-time execution of untrusted software," explains the since removed Insider Feedback Hub page. "This is basically an in-box, speedy VM that is recycled when you close the app!" Commenting upon the 'InPrivate Desktop' features, veteran Microsoft watcher Mary Jo Foley reckons the feature sounds quite similar to Windows Defender Application Guard (WDAG). WDAG isolates potential malware and exploits downloaded via the browser and isolates and contains the threat using virtualization-based security. However, her requests to Microsoft for comment garnered no explanation or further information. Foley says that InPrivate Desktop may not make it into Windows 10 'Redstone 5' but is more likely to roll out in a subsequent Windows 10 update codenamed 19H1. 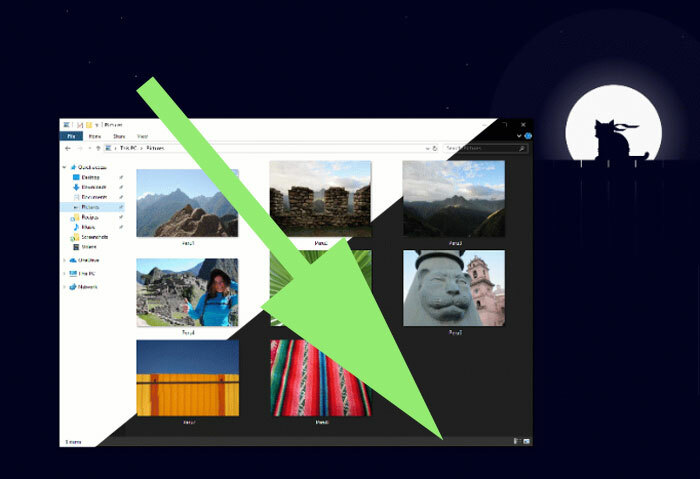 On the topic of Insider previews for Windows 10, Foley pointed out that a new Windows 10 Fast Ring test (build 17733) was made available to Insider testers on 8th August and included a dark mode File Explorer. See the light/dark difference in the image above. And why can't ‘pro’ users get access to this type of thing…. isn't ‘pro’ aimed at small businesses and power users, if not why even bother with the home version….